Kristen Wiig’s Barbara Minerva fights off an attacker in latest Wonder Woman 1984 set pictures. The Wonder Woman sequel is deep into production, but we haven’t seen a whole lot of Kristen Wiig on the set, and we have yet to see her as Cheetah. However, we have seen a tease of her Cheetah powers in a leaked set video from over the summer, which shows the character making a crazy leap into the air, using harnesses. 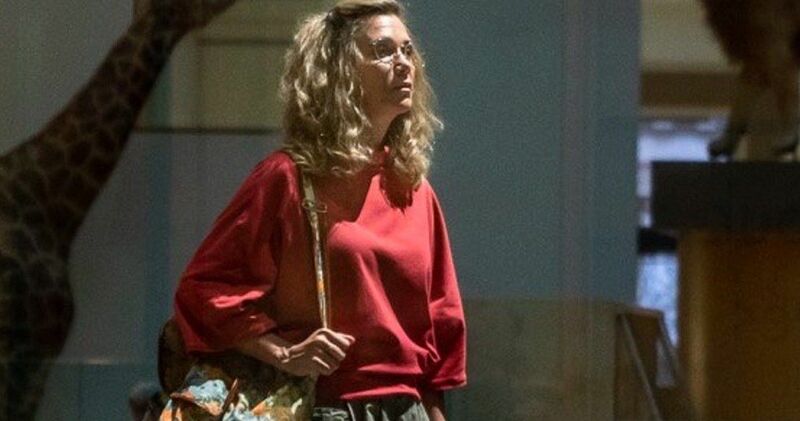 The new Wonder Woman 1984 set photos feature Kristen Wiig’s Barbara Minerva in what appears to be the same outfit from the picture that director Patty Jenkins first shared at the end of June. However, instead of checking out items in a museum, Minerva is being attacked by an unknown assailant. Taking that into account, it’s safe to assume that she has not yet acquired her powers, or is just not aware of them yet. It’s hard to tell without any context, but this could be where we see Minerva figure out that she has some new strength. Wonder Woman 1984 has been filming since June and it’s believed that production is a few weeks away from finishing. Back when the sequel was filming around the Washington D.C., there were a lot more leaks from the set, including some video of what looks like Gal Gadot’s Diana Prince possibly flying her invisible jet. Chris Pine has also been spotted on the set, sporting some pretty awesome 1980s gear. However, since the production moved overseas, we’ve seen a lot less of the leaks, which more than likely means that they’ve been shooting on indoor sets or closed outdoor sets in the middle of nowhere. Kristen Wiig was officially announced as the main villain of Wonder Woman 1984 back in March of this year. Now that we’ve seen more than a few pictures of Barbara Minerva, fans are wondering how she’ll look in full Cheetah makeup. It isn’t clear how the sequel will take on Cheetah’s introduction into the DCEU, but it has been heavily rumored that Diana Prince and Minerva will be friendly before the transformation takes place, which is based off of the Rebirth comic series. Wonder Woman 1984 hits theaters in November of 2019, so there’s still plenty of time before we get to see any footage. Patty Jenkins and Gal Gadot were originally pretty forthcoming with set pictures at the start, but that was more than likely to beat the leakers, much like what Todd Phillips just did for his Joker movie. Phillips shared a video of Joaquin Phoenix in full costume and makeup the day before they started shooting in New York City. Since then, there’s practically a new leak from that particular set every day. It’s probably going to be a little while before we end up seeing Kristen Wiig in full Cheetah makeup. While we wait, you can check out the latest Wonder Woman 1984 set photo below, thanks to The Daily Mail U.K.